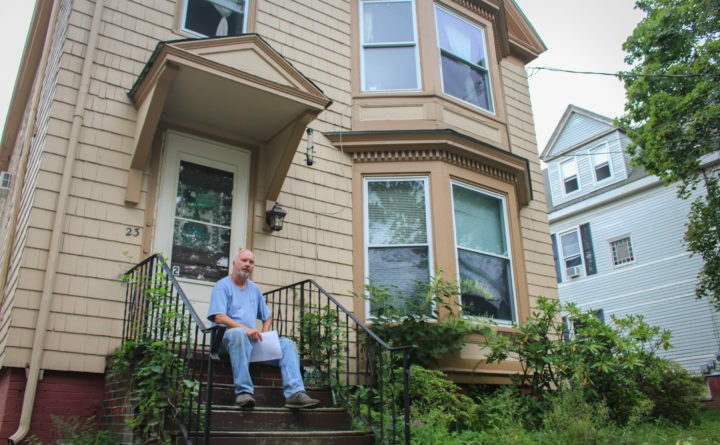 Landlord Mark Barriault sits on the steps of his building at 23 Nevens Street in Portland, where city inspectors found a illegal fourth unit. From the top floor of the old, white house you can look out a pair of small windows and see the burned out foundation across the street, left by a fire that killed six people in 2014. 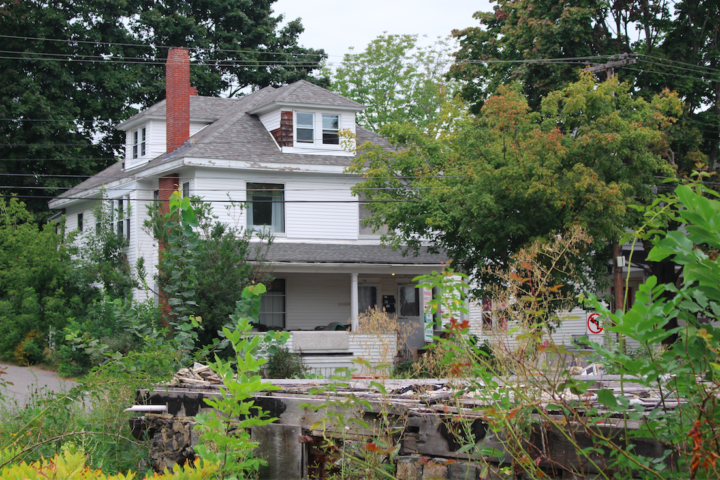 Over the last four years, as weeds have grown around the wreckage at 20 Noyes St., the blaze has prompted a reckoning with housing safety in Maine’s largest city and, ultimately, landed the building’s owner in jail. Sarah Rubin still gets goosebumps remembering the morning of the fire, when her tenants called to say that the house across the street was consumed by flames and someone had leaped from a window. Rubin, a 38-year-old teacher, said the fire drove home her and her husband’s “acute responsibility” to ensure their tenants’ safety. But it wasn’t until years later, she said, that they learned the windows in their top-floor apartment were too small — essentially the same code violation that earned landlord Gregory Nisbet a misdemeanor conviction and 90 days in jail for the deadly fire nearby. The third floor apartment at 17 Noyes St. is one of scores of Portland dwellings that the city has identified as “illegal” or “nonconforming” through thousands of inspections over the past two years. Since January 2017, when the city reorganized its housing safety office and began specifically tracking such units, inspectors have found code violations in converted garages, finished basements, top-floor apartments and other spaces, totaling to 81 “illegal” units at 72 properties, according to Michael Russell, director of Portland’s Permitting and Inspection Department. “It’s a terrible feeling to know that there’s something wrong with your building and you have to tell somebody that they need to find another place to live,” Rubin said. The apartment building at 17 Noyes St. looks over the wreckage still left behind from a 2014 fire at 20 Noyes St. that killed six people. Sarah Rubin, who owns 17 Noyes St. with her husband, said that the deadly blaze drove home their "acute responsibility" to ensure their tenants' safety. Of the properties where the city has identified “illegal” units since January 2017, the landlords of 33 have opted to bring them up to code, with 15 of those having already been issued new certifications of occupancy, according to Russell. Another 10 are awaiting new inspections or are in some other stage of review. The city is currently following up with the owners of 16 properties that were recently issued notices of violation and the landlords of 13 others have chosen to vacate and close the nonconforming apartment spaces. Buildings can be found not to conform with city code because of current violations or because past renovations were done without city approval. Mark Barriault is dealing with both. The landlord said he plans to make changes to his Nevens Street property, including replacing some top-floor windows, to bring it up to code. Like Rubin, Barriault said that city staff have been consistently helpful, but he’s worried he’ll have to stop renting an apartment because he doesn’t have records to prove it was converted from a garage before he bought the building in 1986. If the unit doesn’t qualify for a historic exemption or some other leniency from the city, Barriault said he may have to sell the buildings to a developer. While it might be regrettable to take apartments off the market amid Portland’s housing crunch, city officials say the identification of units that don’t comply with code is a sign that the system put in place after the Noyes Street fire is working. With four full-time inspectors, the city can now inspect about 4,000 rentals each year and prioritizes older properties and ones deemed to have a higher risk of code violations, Russell said. But with an estimated 18,000 rentals, he acknowledged that there are thousands of units haven’t gotten a visit since the inspection process was reorganized. Russell said that the focus on identifying “illegal” units may mean that the rate at which the city finds them increases before their number starts to drop. This is partially because, even for well intentioned landlords, some code violations are not obvious. Follow Jake Bleiberg on Twitter at: @JZBleiberg.